Finding the right mini drone can be quite confusing especially when it comes to first time flyers. The JJRC H36 mini drone is one of my first drone that I got a couple years ago and still have it. Even though the drone and transmitter are different, it stills basically perform the same as the H36 mini drone. Indeed, there are many mini drones that looks the same but when it comes to shopping for the right one. 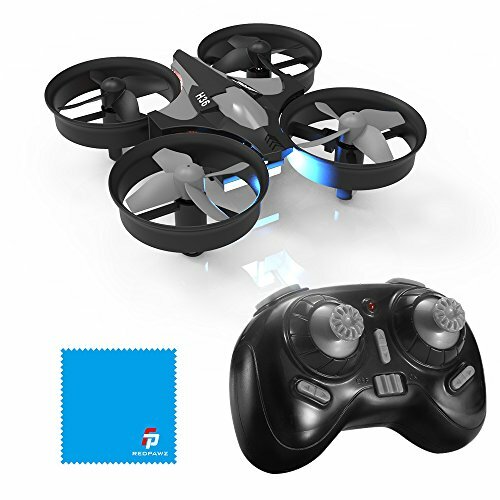 With more than 500 positive feedback from the customers who bought this little quadcopter. It is a serious contender against popular brands such as HS150 Bolt Bee (See Price) and CoFight IN 1802 Drone (See Price). Even to this date, this mini drone is still going strong and a popular choice among beginners. But is it a great drone? In this article, I have assembled an in-depth review to guide you through your drone shopping decisions. Let’s find out if the H36 mini drone suits you! 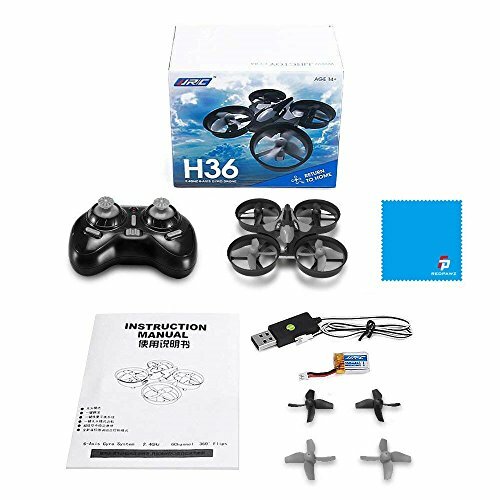 There are many variety of H36 Mini Drone. 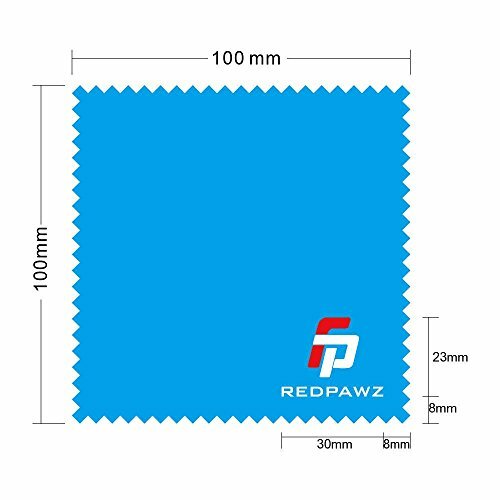 While the design stays the same, they can come in different colors such as red, green, blue or even black. I received this drone from AliExpress which features chrome red color. On my first impression, the drone appears to be well-made. I especially liked how the drone is outfitted with propeller guards surroundings its blades. The propeller guards provides protection to the blades as well the drone itself. However, it does comes with a minor drawback. These guards are not removable. But because of its small size and low price tag, it wouldn’t matter if it came with built-in guards or not. Since the H36 mini drone fills in the role as a “training quadcopter” for those who wants to learn how to fly one as well simply to have fun. Another noticeable design is the four-pronged blades. That style of propellers is much more effective than two-blades as it helps keep the drone stable and glide across the room with ease. The motor arms are accompanied by rubber pads that softens the impact of landing. On the bottom of the drone’s hull body is the battery compartment. It is not exactly the state-of-art modularized battery as you would see on modern quadcopters such as X12 Drone (See Price) and HS160 Shadow (See Price). Inserting the battery inside the drone for the first time will take a few minutes since it needs to be squeezed inside. After few uses, you won’t have any issues inserting the battery in the drone. The drone holds the battery pretty well when I am flying it around. But I didn’t like how the battery wires are hanging outside. To avoid the risk of propellers hitting the wires, I suggest that you bend the wires downward. The wires will stay on its own after you tweak it a little bit. Furthermore, the LED lights are located on front and rear. While you really can’t see it during day time, it is especially useful for night flight operations. Even more fun when you are flying in a dark room! The JJRC H36 mini drone is an excellent choice for indoor activity. While it doesn’t have any strong propulsion force to sustain its flight speed in windy conditions, I advise you to fly it outdoor only when the weather conditions is nice. 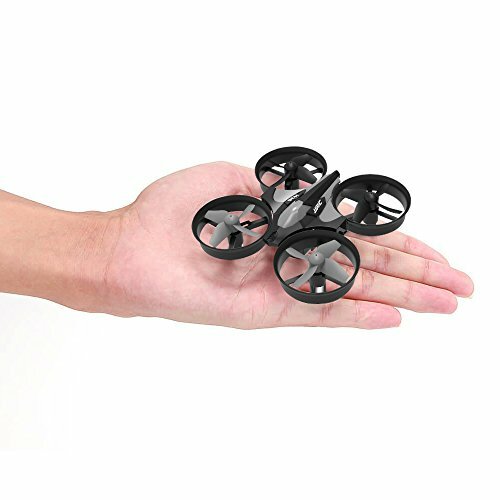 This mini drone can fly under 5 mph without any issues, but any higher than that and you will have a hard time controlling it. The battery is advertised as a 6 minutes flight time. But on average you will be able to fly it for up 4 to 5 minutes. Performance-wise, this mini drone comes with few useful features. For starters, it comes with headless mode, altitude hold mode and 360-degree flip mode to awe your audience. However, you will have to tweak its stability a bit via trimming. Once you feel that the drone can stay relatively stable, it is overall a great starter drone for first-time flyer. As I mentioned previously that there are different brands but looks and performs the same. I researched on the product that I bought from AliExpress and the product that is sold on Amazon. Both have exact same functions and features. So, the only difference is the layout design. The remote controller itself is very small that can easily fit with your palm of hands. It doesn’t come with good inscription unlike the ones you would see on more modern quadcopters. So you will have to read the instruction manual to learn what each button does. After few flight practices, you will be able to fly it without having to figure out which button does. To get into the details, the remote controller consists of levers, trimmings and additional features. On the front view, you can see trimming buttons that are being used to adjust the drone’s stability. If you feel that the mini drone is too hard to control, simply trim to correct its positioning. Moreover, you can launch automatic takeoff and landing with a push of button. This process simplifies your flight process. The same is true for automatic landing. Furthermore, on the shoulder of the transmitter are the feature buttons. They are the 360-degree flips and headless mode. To perform 360-degree flips, you will have to fly the drone in a direction then push the button to activate it. 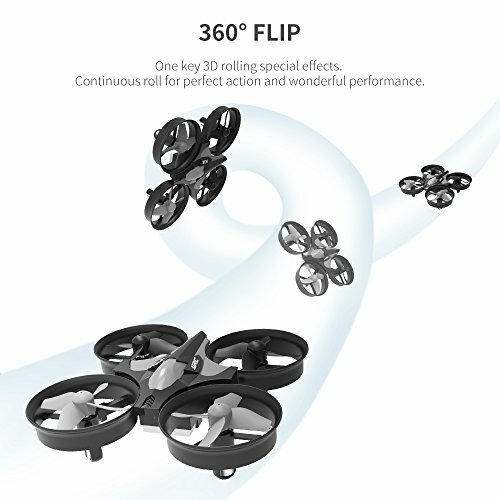 Unlike the recently released DJI Tello (See Price) that can do 8D flip, the H36 mini drone only can flip in four directions. Which means forward, backward, left and right. 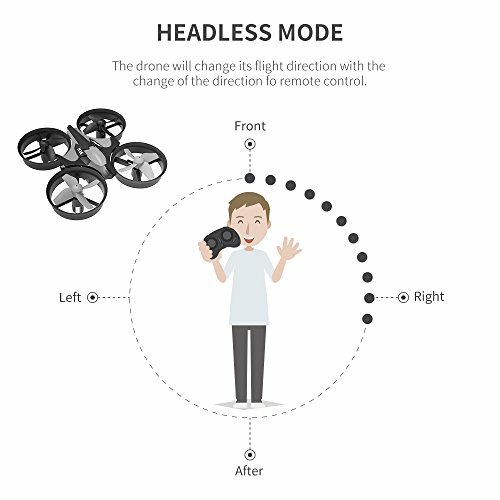 Lastly, you might be wondering what the heck is a headless mode? 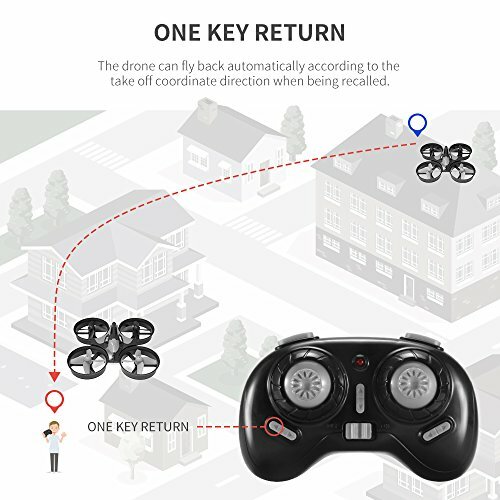 Basically, this feature switches the orientation of controls from the drone to your remote controller. Instead of flying in the direction your drone is facing at. It will fly accordingly to the direction you are pushing the levers on the remote controller. Pretty cool feature. As I am about to conclude the H36 mini drone in-depth review, I want to share my final thoughts about this toy-grade quadcopter. I have flown this a few times and really enjoyed the quality that it has to offer. You have to understand that it doesn’t comes with a lot of features that most of advanced drones have. But that comes at significant lower price tag. What I think makes this mini drone a great steal is how easy it is to fly. The H36 mini drone itself is not that complex at all. Rather, it is very simple and only consist of necessary components to start flying a drone. As I mentioned previously it comes in many different colors and shapes. But I think this one is the best out of all for starters. Thanks to its built-in propeller guards and quality craftsmanship. 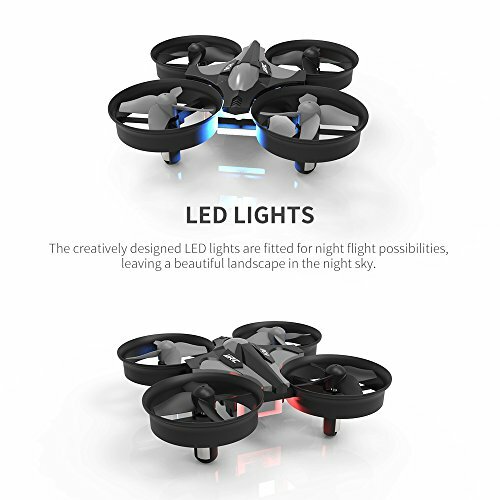 It is a mini drone that you can really enjoy indoor both during the day and night. The H36 Mini Drone is a quality starter drone for beginners and first-time flyers who are new to drones. It doesn't comes with a lot of features, but it is stable and easy to controls that makes it especially a popular choice for starter. Snaptain H823H Review: Best Quality Mini Drone for Beginners and Kids?